Just in time with the arrival of AMD’s new Richland-based desktop APUs (officially referred to as the 2013 Elite A-Series APUs for Desktop PCs) into our market, AMD Malaysia have recently kicked off a week-long roadshow at Plaza Low Yat to publicly show off the capability of their latest and most powerful desktop APUs to date. We don’t have the roadshow’s complete list of activities in our hand but apparently, there are quite a number of machines that visitors able to use in order to experience the new APUs themselves. In addition to that, there are also daily cash rebates for early birds customers and bundle deals for the new Richland-based desktop APUs as well as the previously released Trinity-based APUs and Piledriver-based FX CPUs. Also available at the roadshow are variety of notebooks, All-in-One PCs and branded desktops; all running on AMD APUs. It is unknown whether AMD Malaysia will bring this roadshow to other part of the country but we are pretty sure it will definitely not the last time we heard of such effort from AMD Malaysia to further spread the usage of their APUs among local users. 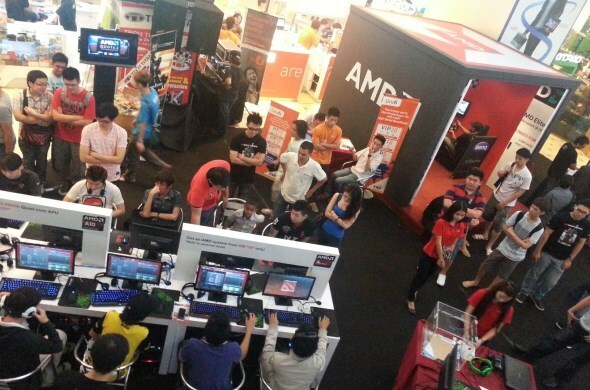 To learn more about the AMD Malaysia’s on-going roadshow in Plaza Low Yat (which ends tomorrow), just head on to their official Facebook page at facebook.com/amdmalaysia.